There shall be only three designations in respect of teachers in the degree level Engineering Colleges and other degree level technical institutions, namely Assistant Professors, Associate Professors and Professors. Also there shall be no change in the present designations in respect of Library and Physical Education Personnel at various levels. c) Each cell in an academic level is at 3% higher stage than the previous cell in that level. d) The Index of Rationalisation (IOR) is 2.67 for present AGP less than Rs. 10,000 and 2.72 for AGP of Rs. 10,000 and above. g) For fixation of pay of an employee in the Pay Matrix as on 1st January 2016, the existing pay(Pay in Pay Band plus Academic Grade Pay) in the pre-revised structure as on 31st December 2015 shall be multiplied by a factor of 2.57. The figure so arrived at is to be located in the Academic Level corresponding to employee’s Pay Band and Academic Grade Pay in the new Pay Matrix. If a Cell identical with the figure so arrived at is available in the appropriate Academic Level that Cell shall be revised pay; otherwise the next higher cell in that Academic Level shall be the revised pay of the employee. If the figure arrived at in this manner is less than the first cell in that Academic Level, than the pay shall be fixed at the first cell of that Academic Level. On promotion, he would be given a notional increment in his existing Academic Level of Pay, by moving him to the next higher cell at that level. The pay shown in this cell would now be located in the new Academic Level corresponding to the post to which he has been promoted. If a cell identical! with that pay is available in the new level, that cell shall be the new pay; otherwise the next higher cell in that level shall be the new pay of the employee. 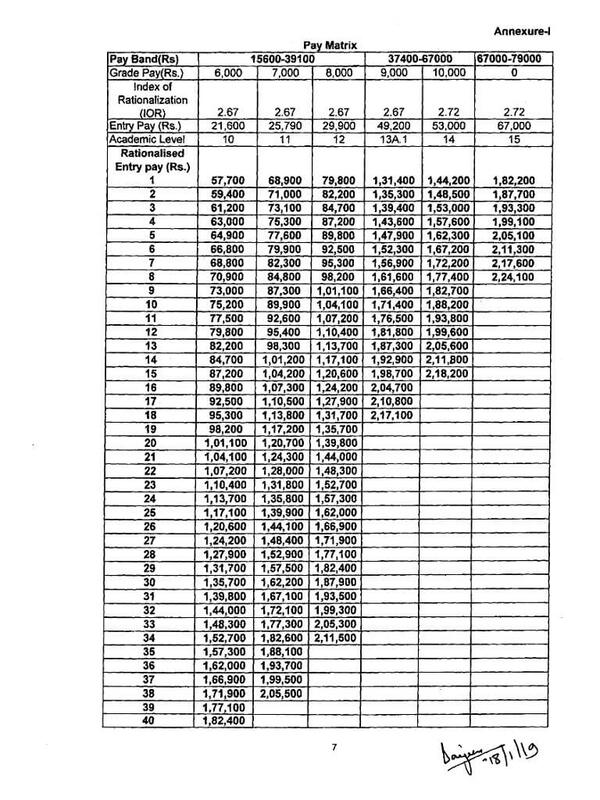 If the pay arrived at in this manner is less than the first cell in the new level, than the pay shall be fixed at the first cell of that level.